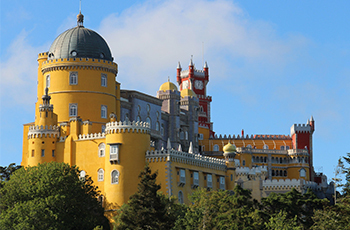 In the shadow of Lisbon, Sintra’s parks and castles speak of Portugal’s regal past. Explore its treasures and visit nearby Lisbon’s museums and neighborhoods. Join pilgrims in Fátima and visit historical towns like Evora and Sesimbra, taking in the beautiful views of central Portugal. Stay in a comfortable apartment in lovely, central Sintra. Day trip options: Lisbon, Évora, Caiscais, Sesimbra, Óbidos, Caba da Roca, Fátima and Nazaré, Sesimbra, Tomar, the wine regions, natural parks and more. Day trips: You’ll want to spend plenty of time exploring Lisbon. Beyond find history and natural beauty in places like Évora, Caiscais, Sesimbra, Óbidos, Caba da Roca, Fátima and Nazaré, Sesimbra, Tomar, the wine regions, and much more. Sightseeing: Explore all that Lisbon has to offer, including its most beautiful gardens and churches, its street life, and inviting neighborhoods like Alfama. Discover nearby Jeronimos Monastery in Lisbon and Montserrat right in Sintra, both gorgeous diversions. Beyond Sintra and Lisbon, find history and natural beauty in places like Évora, Caiscais, Sesimbra, Óbidos, Caba da Roca, Fátima and Nazaré, Sesimbra, Tomar, the wine regions, and much more. Off-the-beaten-track treasures that can’t be beat: Enjoy the coastline of outer Sintra. Spend some time exploring lesser known sites in Lisbon, like the trendy Príncipe Real and LX Factory areas, look for vivid street art, or relax in Jardim do Torel, Lisbon’s lesser known park. Get out of town and tour the Cheleiros and Bucelas wine regions, tasting some of Portugal’s best wines, exploring the vineyards, and talking with winemakers. Explore a convent and castle once controlled by the Knights Templar, and follow the intriguing trail of their history through the beautiful villages of Constância and Tomar. Hike the mountains and savor the views in Arrábida National Park, and visit the surrounding vineyards, some of the best in the region. A local transit pass that also offers free and reduced admission to Sintra and Lisbon attractions. An optional rental car (extra charge). didn't have any problems communicating. Having a rental car in Sintra would not be necessary. Public transportation is nearby and basically included. Traffic is awful and parking basically non existent near some apartments."